With over a million followers on the social network Twitter, and a reputation for a steady stream of social media engagement (he even tweeted Jersey Shore bad girl Snooki a warning when she was tweeting while driving), Newark Mayor Cory Booker is now putting his social media savvy to the task of helping Newark residents find work through collaboration with the social recruiting mega-site TweetMyJobs. PC magazine has called TweetMyJobs one of the "10 Best Job Search Websites" Mayor Booker joins the City of Atlanta in tapping into the social jobs recruitment platform. Discussing how the mechanics of the program work, Mayor Booker explained that in addition to providing job seekers with real-time information about job openings, the platform would also let job seekers see which of their Facebook friends might already be working at the place of business where a given opening might exist. He noted that this would create an added advantage to job seekers as they could then reach out to their friends for added guidance on applying for the opening. 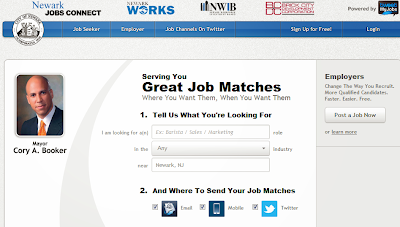 A visit to the Newark-dedicated TweetMyJobs platform shows that job seekers are asked to identify the sort of job and industry employment they are seeking, and where they would like information about job opportunities sent. Job seekers can receive an email, text or tweet about any job opportunities meeting their specifications. Employers, in turn, are given the opportunity to share their job openings with TweetMyJobs to keep the job opportunities coming. According to the Newark site, companies posting job openings to the site include: the financial institution Citi, retail giant Sears, car rental giant Enterprise, and the ever-social Starbucks. Though some of the job openings are in the City of Newark, many are also in surrounding communities. The jobs range range a broad gamut of opportunities and skill levels, from manual labor to managerial, tech, and sales - a good thing when so many are looking for work! For more "Jersey tweets", please join me on Twitter at @JerseySocial and at my primary account, @GlenGIlmore. Special thanks to my friends @2morrowknight and @AnnTran_ for having invited me in join them in their Huffington Post article! PC magazine has called TweetMyJobs one of the "10 Best Job Search Websites" Mayor how to buy instagram followers Booker joins the City of Atlanta in tapping into the social jobs recruitment platform.